Most come with a common "0" point for both Metric & English measuring. "0 end" tapes start measuring from the end of the tape. Our tapes are Blank End tapes (shows "0" on the tape) unless specified as "0 end" in the product description. 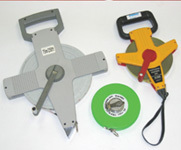 ... 100' / 30m - See the Keson Tapes below. ... 165' / 50m - See the Keson Tapes below. ... 200' / 60m See the Keson Tapes below. I purchased this measuring tape for my officiating bag, in case the need arises to measure distances, either in running or field events. It is durable and had a reasonable price.